Album Review: Balance and Composure - Acoustic 7"
Being a musician, rock duos that consist of nothing more than a guitarist and a drummer really just don't seem fair. You could be in bands of up to five pieces and still not be getting as much sound as energy as a band with nothing more than a fuzzed out guitar and heavy drumming. 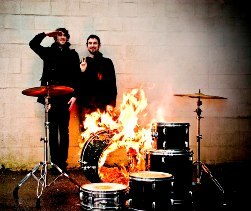 Canadian rockers Japandroids are easily the best example of this archetype. Never before has there ever been so much catchiness, energy, and excitement from just two angry, sexually frustrated young boys. After three years of touring with their explosive debut Post-Nothing, Japandroids are returning this June with their sophomore effort, entitled Celebration Rock. And if lead single "The House That Heaven Built" doesn't get you unbelievably excited for what I expect to be the greatest punk album in a very long time, then nothing will. The uplifting lyrics, the relentless drums, the gang vocal "oh oh oh oh oh oh oh oh" choruses, all of it is just Brian King and David Prowse doing what they do best, and making their best track to date. On Celebration Rock, the band stated that they wanted to replicate what the audience would be doing at their shows through their music. Which on "The House That Heaven Built," is a sound that they easily perfected. By just listening to it you can feel the room around you pounding along with the jumping and the dancing, and you can hear all 300 people packed in the venue screaming the "oh oh oh"s , bringing the overwhelming sensation that any good punk show should. And if the boys can keep that up for eight more tracks, then Celebration Rock is going to be one hell of an album.